Marsupial mole is the common name for any of the marsupial mammals belonging to the family Notoryctidae of the order Notoryctemorphia, as well as for members of the order Notoryctemorphia itself. There are two extant species in this family and order, Notoryctes typholops (southern marsupial mole) and Notoryctes caurinus (northern marsupial mole). The extant species are characterized by a tubular body shape, short silky fur, short and stout tails, functionally blind eyes, snouts covered by a horny shield, forefeet with enlarged third and fourth digits with enormous claws, and a highly fossorial behavior that is strongly specialized for burrowing in soft, sandy soil. These small mammals (about 4 to 8 inches in body length) are endemic to Australia, and found in and around desert areas in Western Australia. Marsupial moles play useful ecological roles in terms of aerating the soil and increasing water penetration through borrowing, and in food chains. Marsupial moles feed primarily on a variety of invertebrates, including insect pupae and larvae, centipedes, beetles, and ant eggs, but also seeds, vegetable matter, and some small salamanders and lizards. When above ground, they are vulnerable to red foxes, dingos, snakes, birds, and feral cats. Marsupial moles are rare and poorly understood burrowing mammals of the deserts of Western Australia. The most fossorial of all the marsupials, they also are the only Australian mammals specialized for a burrowing lifestyle (ZSL 2014). They spend the majority of time tunneling below the ground's surface, pushing through with their horny noses; however, they do not dig permanent burrows, but the tunnels collapse or are filled in behind them as they move. As described by Myers (2001), "these animals 'swim' through the soil." The two species of marsupial moles are so similar to one another that they are often confused in the field (ZSL 2014). The body of marsupial moles is tubular. The tail is a short, bald stub, covered in leathery skin, a couple of centimeters in length (Glyshaw 2011). The overall length of marsupial moles is some 13 to 16 cm (Glyshaw 2011; Wasleske 2012) and they 40 to 60 grams. They are uniformly covered in fairly short, very fine pale cream to white hair with an iridescent golden sheen. Their pouch has evolved to face backwards so it does not fill with sand, and contains just two teats, so the animal cannot bear more than two young at a time. The limbs are very short, with reduced digits. The forefeet have two large, flat, triangular claws on the greatly enlarged third and fourth digits, which are used to excavate soil in front of the animal. The hindfeet are flattened, and bear three small claws; these feet are used to push soil behind the animal as it digs. In a feature unique to this animal, the neck vertebrae are fused to give the head greater rigidity during digging (Gordon 1984). Marsupial moles provide a remarkable example of convergent evolution, with moles generally, and with the golden moles of Africa in particular. Although only related to other moles in that they are all mammals, the external similarity is an extraordinary reflection of the similar evolutionary paths they have followed. They are insectivorous, feeding primarily on invertebrate (largely beetle) larvae and cossid caterpillars (Gordon 1984). Although the Notoryctidae family is poorly represented in the fossil record there is evidence of at least one distinct genus, Yalkaparidon, in the early Miocene sediments in the Riversleigh deposit in northern Australia (Gott 1988). This discovery, in 1985 in limestone deposits, was of a fossil between 15 and 20 million years old, and had molars like a marsupial mole, diprotodont-like incisors, and a skull base similar to that of the bandicoots. These features were by no means identical to the living species, but clearly related. The first known specimen of the present species to be collected was found by in the southern part of the Northern Territory of Australia by a W. Colthard on a cattle station. He forwarded the specimen to South Australian Museum, where it was received by E. C. Sterling, the Director of the museum. Stirling announced the discovery on September 4, 1888 in a paper delivered at the Royal Society of South Australia. However, not finding any trace of a marsupium, epipubic bones, or a separate urogenital orifice in the poorly preserved specimen, he initially speculated the mole was a monotreme (Johnson and Walton 1989). For many years, marsupial moles place within the Marsupialia was hotly debated, some workers regarding them as an offshoot of the Diprotodontia (the order to which most living marsupials belong), others noting similarities to a variety of other creatures, such as the placental golden moles, and so forth. The mystery was not helped by their near complete absence in the fossil record. On the basis that marsupial moles have some characteristics in common with almost all other marsupials, they were eventually classified as an entirely separate order: the Notoryctemorphia. Molecular studies indicate that notoryctids are not closely related to any of the other marsupial families and supports the view that they should be placed in an order of their own, Notoryctemorphia (Calaby et al. 1974; Westerman 1991; Myers 2001). Furthermore, molecular data suggests that Notoryctemorphia separated from other marsupials around 64 million years ago (Kirsch et al. 1997). Although at this time South America, Antarctica, and Australia were still joined, the order evolved in Australia for at least 40-50 million. The Riversleigh fossil material suggests that Notoryctes was already well adapted for burrowing. Just like the modern forms, it had many of the features that are assumed to be adaptations for a life burrowing in desert sands, in particular the powerful, spade-like forelimbs. The Riversleigh fossil deposits, however, are from an environment that was not remotely desert-like: in the Miocene, the Riversleigh area was a tropical rainforest. In other words, the marsupial mole had been burrowing long before the Australian deserts came into being (Thompson 2000). The increase in aridity at the end of Tertiary was likely one of the key contributing factors to the development of the current highly specialized form of marsupial mole (Benshemesh and Johnson 2003). One suggestion advanced for the spade-like forelimbs of the Miocene marsupial mole was that its used limbs for swimming rather than burrowing. However, the mainstream view is that it probably specialized in burrowing through a thick layer of moss, roots, and fallen leaf litter on the rainforest floor, and thus, when the continent began its long, slow desertification, the marsupial moles were already equipped with the basic tools that they now use to burrow in the sand dunes of the Western Australian desert. The northern marsupial mole or northwestern marsupial mole (Notoryctes caurinus) is found in north-central Western Australia in and around several desert areas: the Great Sandy Desert, Little Sandy Desert, Gibson Desert, and Great Victoria Desert. They inhabit sandy dunes, dunefields, sandplains, inter-dunal flats, and sandy soils along river flats. Highly fossorial, they spend most of their time 10 centimeters to 2.5 meters below the surface, and prefer continuous areas of suitable habitat (Wasleske 2012). The northern marsupial moles are smaller than but similar in appearance to southern marsupial moles. Adults range from 10.0 to 20.5 cm (3.94 to 8.07 inches) in length, with an average length of 16 cm (6.3 inches), and weigh between 30 and 70 grams (1.06 to 2.47 ounces), with an average of 40 grams (1.41 oz) (Wasleske 2012). Northern marsupial moles have short, dense fur that is yellow or cream colored in appearance. As with the southern marsupial moles, they have a tubular body shape, reduced tail, short and strong forelimbs, large claws on the third and fourth digits, keratinized skin on the snout, a pouch that opens to the posterior, slit-like nostrils, and lack functional eyes and outer ear pinnae. Tissue grows over the area where eyes would be. Males have internal testes and females have two teats within their pouch. The flat vertebral column is strengthened and fused at vertebrae 4 and 5 (Wasleske 2012). Northern marsupial moles are considered to breed in November and have one or two offspring, which are born underdeveloped and move directly after birth to the mother's pouch. They are solitary and fossorial, normally tunneling under the surface of the ground (0.1-2.5 meters). Adapted for moving in sand, their "energetic cost of sand-swimming underground is much less than above ground travel," where they shuffle clumsily side-to-side (Wasleske 2012). Northern marsupial moles have a diet that consists primarily of invertebrates, including insect pupae and larvae, small salamanders, ant eggs, centipedes, and small lizards, as well as some seeds and vegetable matter. When above ground, they are vulnerable to predators and are preyed upon by such animals as red foxes, dingos, and feral cats (Wasleske 2012). 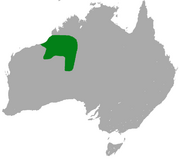 The southern marsupial mole (Notoryctes typhlops) is found in the desert regions of central Australia, along the borders of West Australia, South Australia, and the Northern Territory (Glyshaw 2011). 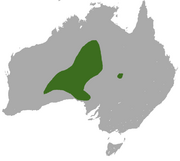 Recent studies indicate that its territory also includes the Great Victoria and Gibson Deserts (Pearson 2000), areas also inhabited by the northern marsupial mole (Wasleske 2012). It is extremely adapted to a burrowing way of life, and its habitat seems to be restricted to areas where the sand is soft, as it cannot tunnel through harder materials (Benshemesh and Johnson 2003). It is particularly common in sandy dunes with dense vegetation of shrubs and grasses; its habitat includes sandy plains and old river plains (Glyshaw 2011) and where where spinifex is present. The southern marsupial moles are slightly larger than but similar in appearance to northern marsupial moles (ZSL 2014; Glyshaw 2011). Adults range from 13 to 14.5 centimeters in length (5.12 to 5.71 inches) and weigh from 30 to 60 grams (1.06 to 2.11 ounces), according to Glyshaw (2011); the Zoological Society of London (ZLS 2014) reports a head and body length of 9 to 18 centimeters and a tail length of 1.2 to 2.6 centimeters, and a weight of approximately 40 to 66 grams, while Johnson and Walton (1989) report head and body length varying from 12.1 to 15.9 cm, a tail length of 2.1–2.6 cm, and a weight of 40-70 g.
The body is covered with short, dense, silky fur with a pale cream to white color often tinted by the iron oxides from the soil which gives it a reddish chestnut brown tint (Johnson and Walton 1989). It has a light brownish pink nose and mouth and no vibrissae (Johnson and Walton 1989). The dorsal surface of the rostrum and the back of the tail have no fur and the skin is heavily keratinized. The cone shaped head merges directly with the body, and there is no obvious neck region. The limbs are short and powerful, and digits III and IV of the manus have large spade-like claws. The dentition varies with individuals and, because the molars have a root of only one third of the length, it has been assumed that moles cannot deal with hard food substances (Benshemesh and Johnson 2003). There is no external evidence of the eyes, and the optic nerve is absent. It does have however a pigment layer where the eyes should be, probably a vestige of the retina. Both lachrymal glands and Jacobson's organ are well developed, and it has been suggested that the former plays a role in lubricating the nasal passages and Jacobson's organ. The external ear openings are covered with fur and do not have a pinnae. The nostrils are small vertical slits right below the shield-like rostrum. Although the brain has been regarded as very primitive and represents the "lowliest marsupial brain", the olfactory bulbs and the rubercula olfactoria are very well developed. This seems to suggest that the olfactory sense plays an important role in the marsupial moles' life, as it would be expected for a creature living in an environment lacking visual stimuli. The middle ear seems to be adapted for the reception of low-frequency sounds (Johnson and Walton 1989). The southern marsupial mole resembles the Namib Desert Golden Mole and other specialized fossorial animals in having a low and unstable body temperature, ranging between 15-30°C. It does not have an unusually low resting metabolic rate, and the metabolic rate of burrowing is 60 times higher than that of walking or running. Because it lives underground, where the temperature is considerably lower than at the surface, the southern marsupial mole does not seem to have any special adaptations to desert life. It is not known whether it drinks water or not, but due to the infrequence of rain it is assumed that it does not (Thompson 2000). While the southern marsupial mole sometimes wanders above the surface, where traces of several animals have been found, most evidence indicates that it does this seldom; rather, it moves just a few meters above ground before burrowing back underground. According to Aboriginal sources, marsupial moles may surface at any time of day, but seem to prefer to do so after rain and in the cooler season (Benshemesh and Johnson 2003). Above the ground it moves in a sinuous fashion, using its powerful forelimbs to haul the body over the surface and its hind limbs to push forward. The forelimbs are extended forward in unison with the opposite hind limb. Moles move about the surface with frantic haste but little speed. While burrowing, the southern marsupial mole does not make permanent tunnels, but the sand caves in and tunnels back-fill as the animal moves along. The only way its tunnels can be identified is as a small oval shape of loose sand. Although it spends most of its active time 20-100 cm below the surface, tunneling horizontally or at shallow angles, it sometimes for no apparent reason turns suddenly and burrows vertically to depths of up to 2.5 meters (Johnson 1996). Although most food sources are likely to occur at depths of approximately 50 cm from the surface, the temperature of these environments varies greatly from less than 15°C during winter to over 35°C during summer. There is little known about the social and reproductive behavior of these animals, but all evidence seems to suggest that it leads a solitary life . There are no traces of large or permanent burrows where more than one individual might meet and communicate. Although it is not known how the male locates the female, it is assumed that they do so using their highly developed olfactory sense (Johnson and Walton 1989). The southern marsupial mole appears to be mainly insectivorous, preferring insect eggs, larvae, and pupae to the adults (Winkel 1988). Based on observations made on captive animals, it seems that one of the favorite food choices was beetle larvae, especially Scarabaeidae (Howe 1973). Because burrowing requires high energy expenditure it seems unlikely that the mole searches for its food in this prey impoverished environment, and suggests that it probably feeds within nests. It has been also recorded to eat adult insects, seeds and lizards. Below the desert sands of Australia, the marsupial mole searches for burrowing insects and small reptiles. The southern marsupial mole was known for thousands of years to the aborigines and was part of their mythology. It was associated with certain sites and dreaming trails such as Uluru and the Anangu-Pitjantjatjara Lands. Aborigines regarded the creature with sympathy, probably due to its harmless nature, and it was only eaten in hard times. Historical records suggest that the southern marsupial mole was relatively common in the late 19th century and early 20th century. There was a large trade in marsupial mole skins in the Flike River region between 1900 and 1920. Large numbers of aborigines arrived at the trading post with 5-6 pelts each for sale to trade for food and other commodities. It is estimated that hundreds to several thousand skins were traded at these meetings, and that at the time the mole was relatively common (Johnson 1991). So little is known about the southern marsupial mole that it is difficult to assess its exact current distribution and trends with respect to its population, but circumstantial evidence suggests that their numbers are dwindling. The southern marsupial mole is currently listed as endangered by the IUCN. ↑ C. Groves, "Order Primates," "Order Monotremata," (and select other orders). Page(s) 22 in D. E. Wilson and D. M. Reeder, eds., Mammal Species of the World, 3rd edition, Johns Hopkins University Press (2005). ISBN 0801882214. Benshemesh, J., and K. Johnson. 2003. Biology and conservation of marsupial moles (Notoryctes). Pages 464-474 in M. Jones, C. Dickman, and M. Archer (eds. ), ''Predators with Pouches: The Biology of Carnivorous Marsupials. Melbourne: CSIRO. Calaby, J. H., L. K. Corbett, G. B. Sharman, and P. G. Johnston. 1974. The chromosomes and systematic position of the marsupial mole, Notoryctes typhlops. Australian Journal of Biological Sciences 27: 529–32. PMID 4447497. Dickman, C., A. Burbidge, K. Aplin, and J. Benshemesh. 2008. Notoryctes typhlops. In 2008 IUCN Red List of Threatened Species. Retrieved March 6, 2014. Glyshaw, P. 2011. Notoryctes typhlops: Southern marsupial male. Animal Diversity Web. Retrieved March 4, 2014. Gordon, G. 1984. Marsupial moles. In D. Macdonald, The Encyclopedia of Mammals. New York: Facts on File. ISBN 0871968711. Gott, M. 1988. A Tertiary marsupial mole (Marsupialia: Notoryctidae) from Riversleigh, northeastern Australia and its bearings on notoryctemorphian phylogenetics. Honours Thesis, University of Sydney, NSW. Groves, C. P. 2005. Order Notoryctemorphia. In D. E. Wilson, and D. M. Reeder (eds. ), in Mammal Species of the World, 3rd ed. Baltimore: Johns Hopkins University Press. ISBN 0801882214. Howe, D. 1973. Observations on a captive marsupial mole, Notoryctes typhlops. Australian Mammalogy 1(4): 361–65. Integrated Taxonomic Information System (ITIS). 2014. Notoryctemorphia Kirsch in Hunsaker, 1977. ITIS Report, Taxonomic Serial No. : 552296." Retrieved March 5, 2014. Johnson, K. 1991. The mole who comes from the sun. Wildlife Australia Spring: 8–9. Johnson, K. A.. 1996. Marsupial mole, Notoryctes typhlops. In R. Strahan, The Mammals of Australia. Sydney: New Holland Publishers. ISBN 1876334886. Johnson, K. A., and D. W. Walton. 1989. 23. Notoryctidae. In K. A. Johnson and D. W. Walton, Fauna of Australia. ISBN 0644060565. Retrieved March 6, 2014. Kirsch, J. A. W. M. S. Springer, and F.-J. Lapointe. 1997. DNA-hybridization studies of marsupials and their implications for metatherian classification. Australian Journal of Zoology 45(3): 211–80. Myers, P. 2001. Notoryctemorphia: Marsupial moles. Animal Diversity Web. Retrieved March 3, 2014. Pearson, D. 2000. Marsupial moles pop up in the Great Victoria and Gibson Deserts. Australian Mammology 22: 115–119. Thompson, G. 2000. Blind diggers in the desert. Nature Australia 26: 26–31. Wasleske, B. 2012. Notoryctes caurinus: Northern marsupial male. Animal Diversity Web. Retrieved March 4, 2014. Westerman, M. 1991. Phylogenetic relationships of the marsupial mole, Notoryctes typhlops (Marsupialia: Notoryctidae). Australian Journal of Zoology 39(5): 529–37. Winkel, K. 1988. Diet of the marsupial mole, Notoryctes typhlops (Stirling 1889) (Marsupialia: Notoryctidae). Australian Mammology 11: 169–161. Zoological Society of London (ZSL). 2014. Marsupial mole, southern marsupial mole (Notoryctes typhlops). Evolutionarily Distinct and Globally Endangered (EDGE) website. Retrieved March 5, 2014. This page was last modified on 7 March 2014, at 00:35.